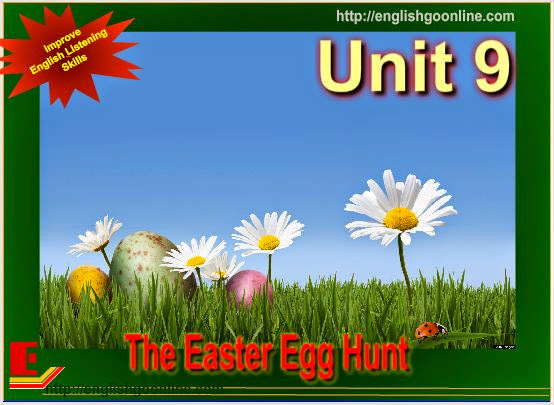 In this lesson, you wil learn� the way planing The Easter egg hunt is at Sydney's house.� Easter egg hunts are a common Easter holiday tradition, especially for children. Organizing an Easter egg hunt indoors can sometimes be your best option, especially if the Easter holiday occurs on a snowy or rainy day. An indoor Easter egg hunt can also be necessary if you live in an apartment or condominium community that does not present the option for an outdoor hunt. Continue reading this article to learn more about how you can organize a fun and exciting Easter egg hunt indoors. ['b?ni]� danh t?��� (ti?ng l�ng c?a tr? em) con th? - Who is this article talking to? - What is she going to do? - What does her mother do? Samantha is going to an Easter egg hunt. Tracey is going to an Easter egg hunt. The Easter egg hunt is at Sydney's house. Sydney's mom hid chocolate eggs. Sydney's mom hid chocolate bunnies. Everybody has an Easter basket. The Easter egg hunt can start. Everybody must close their eyes. Samantha finds an Easter egg. The Easter egg is behind a table. She puts it in her basket. Tracey finds a chocolate Easter bunny. Tracey puts in her basket. Sydney finds a chocolate Easter bunny too. It's in front of the television. She puts in her basket. Everybody finds lots of chocolate. Samantha, Tracey, and Sydney love Easter.